Dr. Ryan Pereira treats patients from Jacksonville and across Northeast Florida, and he says these signs of diabetes should always be taken seriously. Although around 23 million Americans likely suffer from the disease, 1 in 4 are yet to be diagnosed. Recognizing symptoms early could be the key to getting treatment before serious complications develop, including the need for amputation. These sensations could be diabetic neuropathy, a type of nerve damage resulting from diabetes that can be both painful and dangerous. Often patients will not notice small cuts and open sores on their feet when suffering from neuropathy. Unnoticed and untreated, small injuries can become infected and eventually lead to amputation if professional wound care is not applied. Surgery may be required to treat nerve damage, and Dr. Pereira’s team specializes in the most advanced techniques available. Poor circulation is often one of the most noticeable early signs of diabetes. Florida offers plenty of inviting places to go barefoot, like strolling along the beach in Ponte Vedre, so patients are often keenly aware of problems with their feet. Skin that cracks easily and causes pain when walking should raise concerns about circulation. Wounds that won’t heal are also a big red flag. Getting a small cut from stepping on a shell or rock is expected, but if the cut doesn’t heal or looks worse after a few days of proper cleaning and self-care, it should be taken seriously as a sign of poor circulation. Professional wound care can help to fight infection and help wounds begin to heal. In some cases, surgery may be required for treatment and to reduce the risk of amputation. Swelling can be the body’s response to an acute injury, like an ankle sprain or contusion. But unexplained swelling in one or both feet could be an early warning sign of diabetes. Dr. Pereira says this is another condition his patients in Northeast Florida are likely to notice as so much time is spent outside, but they are often tempted to write it off as perhaps a twisted ankle on the golf course or too much sun on the beach. While swelling in the feet could have many causes, anyone at risk for diabetes should not take this symptom lightly. Unless a definite cause can be attributed, Dr. Pereira advises seeking the help of a physician experienced in the treatment of diabetes. He says every patient’s case is unique, but one thing all diabetes patients have in common is the very real threat of complications developing to the point that a foot amputation is required. Seeking a diagnosis at the first signs of trouble is the first step in avoiding the most severe complications of diabetes. Dr. Pereira’s experienced team treats patients with diabetes and other conditions requiring professional wound care, limb salvage, nerve microsurgery and other advanced procedures. 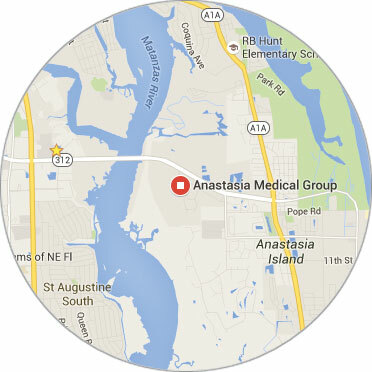 Anastasia Medical Group offers a full-service facility where surgical procedures can be provided on an outpatient basis, without the wait times and inconvenience of a hospital.